Here's why Activision Blizzard is my favorite investment in the growing video game industry. The video game industry is growing faster than the entertainment industry overall. Image source: Pixabay. The market has been kind to video game stocks over the last five years. While I wouldn't mind owning Activision Blizzard's (NASDAQ:ATVI) two largest competitors -- Electronic Arts and Take-Two Interactive Software -- Activision is my first choice because of its diversified base of seven $1 billion franchises, future growth opportunities, and the savvy business skills of its founder and CEO Bobby Kotick. Here are five reasons why I plan on owning Activision Blizzard for a long time. A growing business with recurring revenue is one of the best kind to own. In recent years, the rise of multiplayer gaming has given video game publishers a recurring revenue stream by way of selling add-on expansion packs, maps, and other in-game content that players purchase and download using their PC or console. These purchases are small, ranging from a few dollars to $15, and the content that is unlocked goes a long way to building a game's replay value. It's a win-win for both publishers and gamers. Activision has several games in its portfolio that distribute a steady stream of additional content for players throughout the year. Three in particular are Call of Duty, Destiny, and Overwatch. Although it's becoming a smaller contributor as Activision broadens its portfolio with other games, Blizzard's World of Warcraft has a subscription-based model where players pay a monthly fee to advance through the game. Activision Blizzard's total revenue reached $6.6 billion in 2016, of which about 74% was from digital sources such as subscriptions, in-game purchases, and other items. For perspective, Activision Blizzard's digital revenue was only 34% of total revenue five years ago. Because it costs relatively little to release this additional in-game content, the growth of digital revenue allows Activision to generate higher cash flows. Activision Blizzard generated $2.2 billion in operating cash flow in 2016. This is more than double what the company was generating five years ago. Some of this increase is due to the addition of King Digital Entertainment, a top mobile game developer Activision purchased a year ago for $5.9 billion. Activision's cash-generating ability allowed it to begin paying a dividend to shareholders in 2010, and it has increased that dividend every year since. In the fourth-quarter earnings announcement, the company increased the annual dividend 15% to $0.30 per share, which is a 0.66% dividend yield at the time of this writing. Activision Blizzard generates the highest level of revenue and cash flow in the industry, placing the company in a relatively strong position among its competitors to continue making strategic acquisitions, which CEO Bobby Kotick has a knack for. Acquisitions of King and Blizzard Entertainment have been instrumental in growing the value of the business over the last 10 years. Higher cash generation also gives the top game publisher plenty of capital to reinvest in game development and cement its lead in the video game industry. Activision Blizzard has proven over time with releases of Overwatch, Destiny, and Skylanders that it can produce new franchises that continue growing the value of the business for shareholders. Overwatch gives Activision Blizzard a great opportunity to reach a huge global audience in the fast growing $1 billion e-sports market with Overwatch League. In addition, Activision recently hired a toy industry veteran in Tim Kilpin to lead a new consumer products division to monetize various characters and other intellectual property in the company's franchise portfolio. Also, Activision has been testing in-game advertising with King's mobile games. On a recent investor conference call, CEO Bobby Kotick said, "The King team will continue to build on their efforts this year, and we believe advertising has the potential to be a growth driver in the years to come." He went on to comment about the company's growth opportunities: "We also nurtured emerging growth opportunities outside of our games, including e-sports, television and film, and consumer products, and we enhanced the organizations that will support these initiatives. These new opportunities are consistent with and organic to our company's missions, and they have the potential to become important stand-alone businesses in pursuit of our goal to become the leading 21st century entertainment company." All in all, Activision Blizzard is a company on the move. As I mentioned, CEO Bobby Kotick has a knack for accretive acquisitions that immediately add significant value for shareholders. Toward the end of 2016, the company passed a new compensation agreement with Kotick that incentivizes him to make one or a series of transformative acquisitions in the next five years. In the last 10 years, there have been three such deals that had a great impact on shareholders' return: the Blizzard acquisition, the Vivendi buyback, and the acquisition of King Digital Entertainment. Kotick's new compensation agreement serves as a catalyst over the next three to five years and all but assures shareholders of seeing more accretive deals to significantly grow the value of the business. 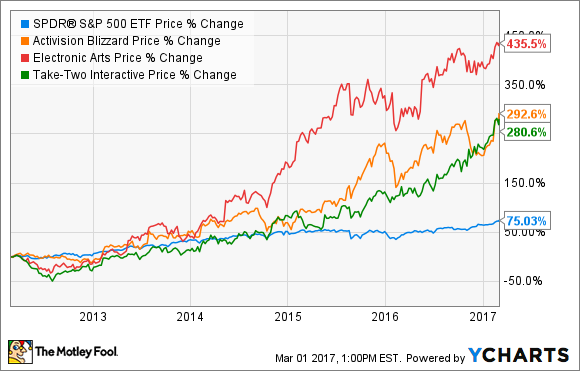 The stock trades for 26 times earnings estimates for 2017, which on the surface is not cheap. Keep in mind, the company has a light slate of game releases in the coming year, which will weight down financial results for 2017. However, over the next five years analysts expect Activision Blizzard to grow earnings per share 16% annualized. This growth could be higher if Kotick makes another acquisition that significantly increases Activision Blizzard's earnings per share. If we look at free cash flow, Activision looks more attractive, with a price-to-free-cash-flow ratio of about 15. Free cash flow is a better indicator for Activision Blizzard as it allows investors to gauge the ability of management to increase the dividend or buy back shares. All in all, Activision Blizzard has plenty going for it, which makes me enthusiastic for what's to come.